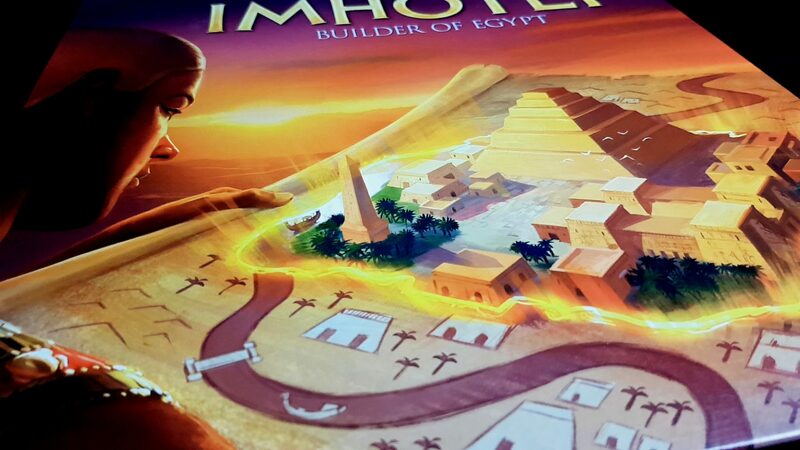 Imhotep is an excellent game that came out of our review with nary a scratch in its immaculate mortaring. Four and a half stars is about as high as we go on this blog, at least to date, and that’s exactly what Imhotep claimed. We had nothing meaningful in the way of critique as far as it goes as a game and that’s never a state of affairs I find particularly satisfying. They do say that complaining is easy. That’s why I like it. It’s easy. Ah, but here? This is where we can really stick a hook up its nostrils in search of something of value we can extract. Put it this way – one way or another we’re interring a corpse in the burial chamber we built in the review. It’s either going to be Imhotep or one of you reading this. There are no issues with colour blindness except in circumstances of full monochromacy. 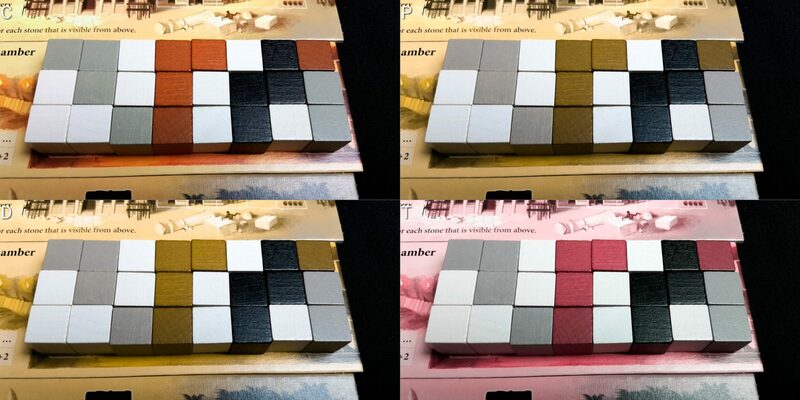 The four colours of blocks are white, black, grey and brown and none of those are a problem for any of the standard categories of colour blindness we consider in these sections. The cards have something more of an issue here, but in the end the colour use is a supplement to the descriptive text on the front. As such the cards are fully accessible even if there may be some occasional confusion regarding to what category one may belong. That’ll be quickly resolved by reading the text or as a natural side-effect of building familiarity with the game. However, the game does use colour as the sole channel of information for the cubes, and they’re used as building components and score tracking. For those with more unusual manifestations of colour blindness this might be a problem because the cubes are large and not feasible to replace given how they are used as physical construction material. You might be able to workshop something with Lego if you have some of that lying around, but you’d run into the same colour problems in the end. That’s important, because the order and position of cubes on boats and in monuments is vitally important – it’s not just enough to know what you own, but also what other people own and where their blocks are. 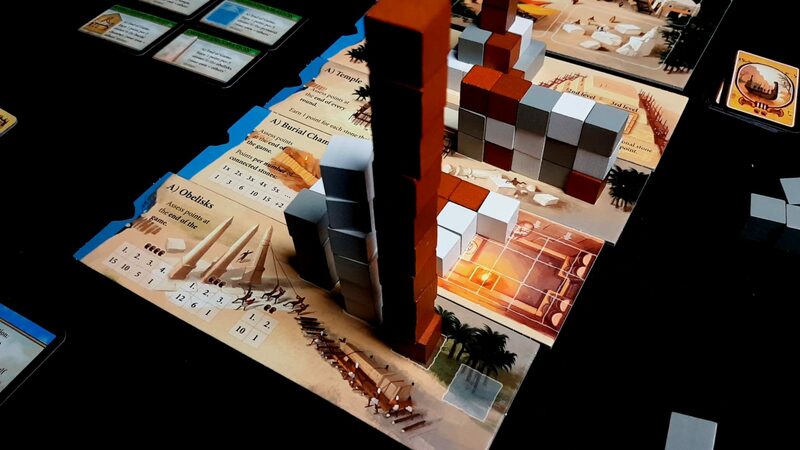 We’ll recommend Imhotep in this category, but bear in mind that for some very rare conditions the blocks will potentially be a game-breaking problem. The blocks that you use during Imhotep are large, chunky and lend themselves reasonably well to physical investigation. Unfortunately, that’s useful in only a relatively small number of places – knowing how many stones you have in your player area and knowing how many stones are loaded on to each boat. You also need to know the colour of blocks to make meaningful decisions although for most boats there won’t be so many stones on them that it can’t be committed to memory. Verbal reminders at the start each of each turn will help there. It’s far more of a problem when it comes to the stones when they are placed in the various sites. The nature of construction means that physical investigation of the game state, even if it were possible to tell colours, is a problem. The temple (a solid wall) and the pyramids (a pyramid) are at least somewhat resilient to touch but the obelisk (a large stack of cubes) is very easy to knock over. Given the fact you build it upwards it’s possible that doing so will have catastrophic impact on the rest of the game state. For example, you might knock obelisks into the burial chamber or knock over the temple wall. It’s not just the blocks but the order of those blocks that is important and so it might be hard to reconstruct the game state should it be upset. That’s also going to be a problem when it comes to placing cubes, although that need not be done by any individual player if it’s likely to be a problem. You do end up missing out on some of the tactility of the game though, which is ironic under the circumstances. That said, there is a degree of verbal description that can be given for most of the sites to permit meaningful decision making. ‘You have six cubes in the obelisk. I have four, Pauline has two’. ‘The current status of the temple is white, grey, grey, brown, white’. The burial chamber is more difficult to describe since essentially you are creating contiguous blocks of cubes and it’s not particularly easy to explain to someone what a ship of stone might do there except in shallow terms. It’s not enough to say ‘This will give you a block of three, me a block of four, and Pauline a block of two’. What happens after that matters because sometimes players will be setting themselves up for new contiguous blocks or permitting short-term poor placement so that their next blocks go somewhere more effective. The market is the easiest of these to describe since there are four cards on offer and the order in which they are purchased is easy to analyse. Their effects are clear, don’t require a lot of memorisation, and can be simply verbalised. For those with less severe visual impairments though, the size of the blocks is likely to lend a considerable degree of support to players because they really are substantive. Bigger is (almost) always better as far as accessibility goes. The second large problem here is that the decision of what to do and where is sometimes dependant on game information that is blocked by the very edifices you’re creating. It becomes difficult even with full vision to see scoring opportunities on the opposite side of the pyramid as one example. Angle of view can be important when it comes to assessing the best thing to do. Asking about scoring also leaks a degree of gameplay intent. If you ask what the second block placed in the pyramid is going to get you’ve given clear indication. A ship where the second block is yours might end up sailing there. Sure, it could be a bluff but there’s only so far bluffing will take you in Imhotep. 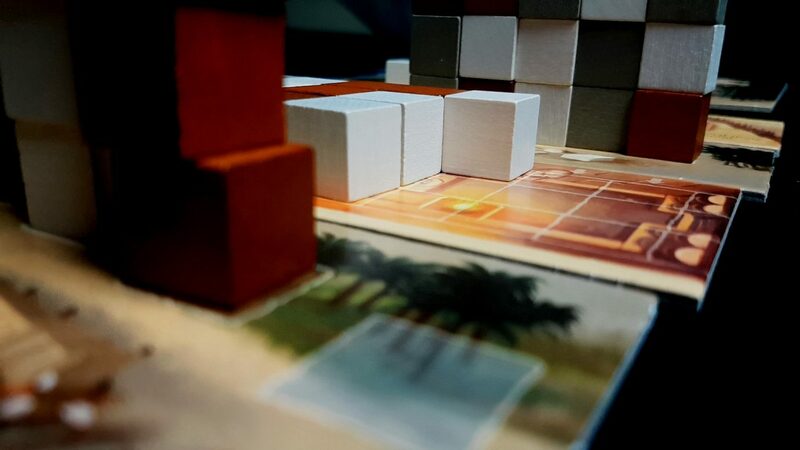 We’ll tentatively recommend Imhotep in this category because it is likely to be playable with support from the table, but it will put a significant amount of cognitive strain on visually impaired players. Even with the best will in the world some of the subtleties that go along with unloading stones is going to be missed. However, those issues become less significant the more visual discrimination a player can call upon. The core game loop of Imhotep is very simple – the actions aren’t complicated and even the special powers that you can buy from the market just let you do two things rather than one for the most part. That does have an impact on game flow but not one that dramatically alters the cognitive expense of play. However, the asynchronous nature of loading and sailing adds a massive cognitive burden to every decision you make. Everything has to be assessed in a tree of ‘If I do this they’ll do that and then I’ll do this’. You want to minimise the risk to yourself when your opponent gets their turn and maximise the benefit to you when your turn comes around again. This is more pronounced in two or three player games because tactical considerations there have more weight. With four players the churn between turns will tend to make this kind of thing functionally unmanageable – weirdly it’s a less difficult game the more people you have to worry about simply because of the sheer agitation of game state that occurs. The largest difficulty here comes not in trying to line up a ship with a destination but lining that ship up with an order of stones that works in your favour. You can easily do yourself damage in this – everyone is going to actively be sending your ships to the places you least want them to go. On which ship you place a stone might be the difference between getting the real points or giving someone else points. Again, this is the min-max nature of the game coming to the fore – you can’t aim for an optimal setup of ships because nobody will ever let you sail it where you want it to go. You want to aim for sub-optimal across multiple boats so that you’re going to make some progress when a ship is sailed away from under you. Playing intentionally sub-optimally is just as challenging as playing optimally. When you’re the one sailing the ship you also need to consider everyone else and what each destination means for your relative rankings. It might be a good idea to give yourself zero points if it means depriving an opponent of a larger payoff. On the other hand, sailing a ship always comes with an opportunity cost so perhaps not. The decisions in Imhotep are satisfying, but that’s because each is a genuine challenge. There are few times in Imhotep where you’re not actively weighing up several viable options and that’s always going to be cognitively expensive. For those with memory impairments alone there are fewer things to be concerned about – the game state is mostly completely transparent (save for the cards still to be drawn from the market deck) and the physicality of the game is a state reminder of its own. The only small consideration here is that some placements result in score indicators being covered up, but by the time that happens the specifics of the scoring is usually no longer relevant (such as within the pyramid). There’s a small need for literacy during play when using the market cards, but a larger and more persistent requirement for explicit numeracy. Essentially when you send a ship to a particular location you’re doing arithmetic to work out what it means for everyone’s scoring. None of that arithmetic is particularly complex but it does need to be done for every possible output of every possible option being considered so it adds up. Given how different the scoring is from site to site and side to side, the combinatorial effect of this can be considerable. We don’t recommend Imhotep for those with fluid intelligence impairments, but we recommend it for those with memory impairments alone. Oh boy. Every single time you sail a ship in Imhotep you are going to be making a spirited attempt to undermine someone else. There’s no way around it, even if you want to play nicely. Even if you don’t want to actively do the worst possible thing for another player you’re almost certainly going to end up with that anyway simply by trying to do the best thing for yourself. Every single thing you do in Imhotep save perhaps for taking stone from the quarry is something somebody else doesn’t want you to do. They don’t want you to load stone onto ships because then you stop them doing the same. They don’t want you to not load stone onto ships because that implies you’re going to send it somewhere bad. They don’t want you to use special power cards or buy cards from the market. Nobody is happy with you at the end of your turn of Imhotep. Essentially the whole game works on a kind of system of deferred disadvantage. You place stones and then you place yourself palms up on the mercy of everyone else. Save for the ‘sail’ cards that let you place stones and sail a ship you’re always going to be in a position where someone else will move the ship you just loaded. Even the sail cards that prevent that might be difficult to obtain – nobody is going to sail you to the market if it’s going to be in your interest to get there. That can be frustrating too, to know the solution to your problem is something people are actively stopping you from getting. You’ll often find your immaculately loaded stones going where they do you the least good – if you already control the obelisk for example people will often use that as a dumping ground for a ship that has a lot of your cargo on it. The only way to prevent this is to send ships before they’re loaded up, and that means constantly playing when you’re not happy with the results. It’s very easy for players to gang up on a runaway leader, or a runaway loser, but the nature of the game means there’s no real reason to do it other than it’ll be happening anyway. There’s limited scope for collaboration but the end result is that everyone picks on everyone else all the time. That’s the genuine genius at the heart of Imhotep but my goodness it’s mean. There’s no player elimination, but it’s certainly possible for score disparities to be high when players of uneven skill levels are playing. There’s sometimes a point in the game where the timing syncs up and one player just gets everything they want while everyone else gets knocked farther behind. When you’re out of step with the rhythm of the game there’s no easy way to get back in – the closest thing you have to passing your turn is picking up stones from the quarry. Your stones, when they are placed on a boat, are no longer entirely under your control and their placement is permanent. If you place one in the wrong spot in the burial chamber it might cost you a few points or it might cost you the game. You can’t, barring the use of a special card, reorder stones on a boat. You’re pretty much committed to every action you take, and Imhotep punishes players for overcommitting. You have to commit exactly the right amount if you want to do well and that is difficult when you’re not responsible for where your stones are sent. We don’t recommend Imhotep in this category. At all. 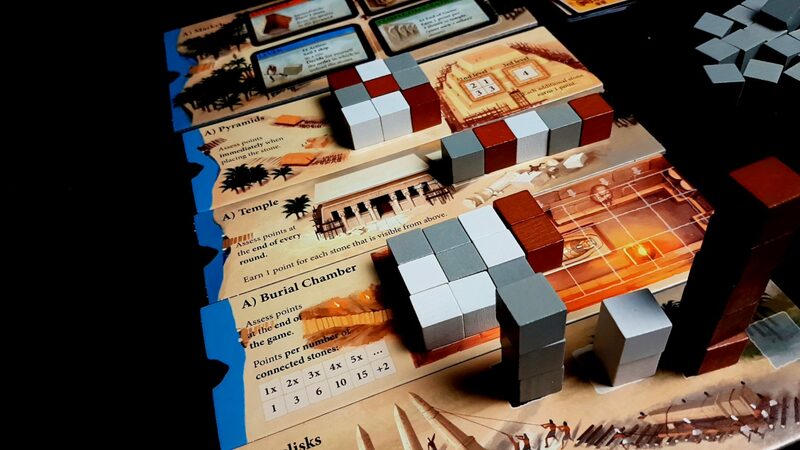 The physical accessibility of Imhotep is bound up in whether or not it’s necessary for an individual player to place the stone blocks in any construction. If that’s required for whatever reason, we’d advise you stay well away from the game. You have to build very fragile towers, brittle walls, pyramid structures and blocks of shapes that are all well aligned. Even the normal adrenaline of placing a cube while everyone is watching can be enough to create a problem here. 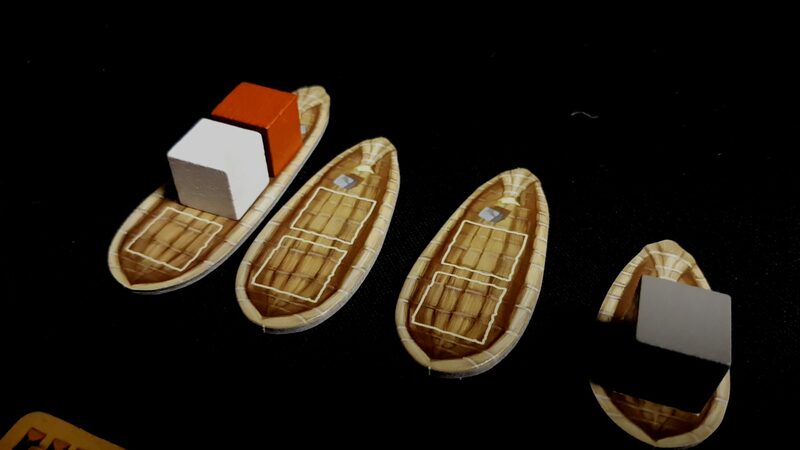 The tactility of Imhotep is not an afterthought – it’s a big part of the enjoyment of the game. Losing it is significant for game feel even if it’s not for the game mechanisms. However, if that’s not required the game is fully playable with verbalisation. There’s no judgement or ambiguity that goes along with anything that happens in Imhotep. Everything has a stately order so all a player need do is say which ship they want a stone to go on, or where they want a ship to go. Even when it comes to special actions, those are completely straightforward. While things like the burial chamber might look difficult to deal with there’s a set order in which things go. Same with the pyramid, and everything else is just stacking. We recommend Imhotep in this category. Just bear in mind that some, but not all, of the fun comes from being able to handle these substantial cubes and construct things with them. There is a small amount of literacy required for play, but it can be dealt with by a crib sheet or through explanation. The effects are not complex and the number of different possibilities is limited. Really there are only eleven cards where that’s relevant and most of them are variations on a theme. The Entrance, Sarcophagus and Paved Path let players instantly place a stone in an appropriate location. The pyramid decoration, temple decoration, burial chamber decoration and obelisk decoration all give points for cubes placed in the specified location. 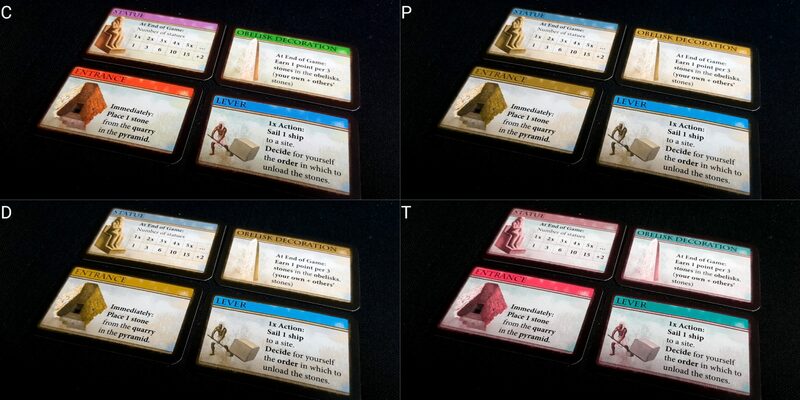 If players associate colour of the card with the effect, they can deduce the rest from context. Only the special action cards are unique in that respect and they can be learned relatively easily. Otherwise, there’s no formal need for communication. We’ll recommend Imhotep in this category. There’s only two gendered pieces of art in the game as far as I can see. One is a male figure on the lever card and the other is the architect on the front cover. Barenpark, from the same designer, had a woman park ranger on the front. It all seems to balance out although that’s perhaps not a reasonable conclusion given the games encompass different publishers and different artists. Still, there’s only so much you can talk about when there’s only one major character represented. The manual doesn’t default to masculinity, adopting the second person perspective throughout. Imhotep has an RRP of £33, but you can occasionally find it quite deeply discounted – it was on that basis I bought my copy. It only supports four players, which means it’s a little awkward for larger families and that’s a shame for a Spiel des Jahres nominee. The cost per player is a little high too, but you are getting a marvellous game with an awful lot of replayability. And also a load of heavy wooden cubes. Visual impairment intersecting with physical impairment might be an issue here, depending on the specific manifestations of both. Some of the game board requires a degree of close inspection, and more of that is going to be necessary the more severe the visual impairment. If players cannot easily manage this, it will have an impact on play. For those with visual impairments intersecting with memory impairments, the amount of game state that must be internalised is likely to be a considerable problem. The compensation for a lot of visual accessibility issues is ‘remember what you need to remember’ and there is a lot of information that changes in relatively sophisticated ways. An intersection here would invalidate our recommendations in both categories. Games of Imhotep are reasonably brisk – the box says forty minutes but I think that’s pessimistic based on our experiences. Accessibility compensations might bring it into that ballpark but generally this isn’t a game that is long enough or intense enough to exacerbate issues of discomfort or distress. That’s good, because it’s not a game that easily supports players dropping in and out – different scoring rules are used at different player counts and even the type of boats drawn in each round changes based on number of people playing. Well, Imhotep actually did better than I was expecting in some of these categories. The low grades for fluid intelligence and emotional accessibility are no surprise given the nature of the game mechanisms. For everything else though it’s a surprisingly strong performance. I don’t go into these teardowns with any fixed expectations. Every day is a school day. However, as is often the case the grades don’t show the full story. A lot of the joy of Imhotep is bound up in the satisfaction that comes along with building a monument. Placing a cube atop a massive obelisk is a dexterity game in and of itself and it’s very satisfying to see it inching above those of your opponents. There’s something mysteriously satisfying about arranging cubes into a pyramid. Some of that is going to be lost if playing in an accessible manner, and that’s important. The tactility of board-games should not be considered an afterthought. We loved Imhotep to the tune of four and a half stars. It’s tightly designed and as tense as a rubber band. It’s cut-throat and challenging in the best possible ways. It’s a constant cycle of putting yourself in the position of asking mercy from people that have no incentive to give it. It’s definitely not going to be for everyone, but so few games are. If you think it might be playable and can find it in yourself to live with being constantly betrayed by people you thought were your friends… well. You could do an awful lot worse than picking this up. Meeple Like Us is engaged in mapping out the accessibility landscape of tabletop games. Teardowns like this are data points. Games are not necessarily bad if they are scored poorly in any given section. They are not necessarily good if they score highly. The rating of a game in terms of its accessibility is not an indication as to its quality as a recreational product. These teardowns though however allow those with physical, cognitive and visual accessibility impairments to make an informed decision as to their ability to play. Not all sections of this document will be relevant to every person. We consider matters of diversity, representation and inclusion to be important accessibility issues. If this offends you, then this will not be the blog for you. We will not debate with anyone whether these issues are worthy of discussion. You can check out our common response to common objections. Teardowns are provided under a CC-BY 4.0 license. However, recommendation grades in teardowns are usually subjective and based primarily on heuristic analysis rather than embodied experience. No guarantee is made as to their correctness. Bear that in mind if adopting them.